A man and a youth charged with the murder of a wedding guest in Co Fermanagh can be released from custody, the High Court ruled on Wednesday. A judge rejected a prosecution appeal against the granting of bail to Patrick McGinley, 23, and a 17-year-old who cannot be named because of his age. The pair are jointly accused of the murder of 63-year-old Bernard McGinley in February 2015. The victim was shot dead outside St Mary’s Church in Newtownbutler. He was gunned down in front of his wife and family as they attended a Traveller wedding ceremony. Police have linked the killing to a wider feud within the community. Two other men are also charged with the murder. Patrick McGinley, of Lisfarrell in Edgeworthstown, Co Longford, and his teenage co-accused both surrendered themselves to the PSNI earlier this week. 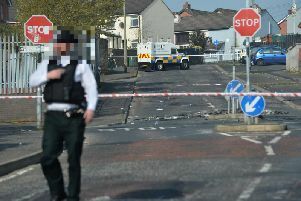 They attended a police station in Northern Ireland knowing they were also to be charged with the murder, their lawyers stressed. Both were granted bail when they appeared together at Omagh Magistrates’ Court on Tuesday. But the Public Prosecution Service sought to overturn that decision at the High Court in Belfast. It was claimed that the pair may flee if released from custody. However, Mr Justice O’Hara dismissed the challenge to the bail order. He ruled that the defendants can be released on strict terms, including sureties of £10,000 and £2,000. They are to live at approved locations and must not leave Northern Ireland.